Because here’s the truth — here’s the truth: Far too long, we have lived with the discomfort of being a second-class citizen, and frankly, I’m tired of it, and every single Muslim in this country should be tired of it. CAIR was founded after 9/11 because they recognized that some people did something and that all of us were starting to lose access to our civil liberties. So you can’t just say that today someone is looking at me strange, that I am going to try to make myself look pleasant. You have to say, “This person is looking at me strange. I am not comfortable with it. I am going to go talk to them and ask them why.” Because that is a right you have. 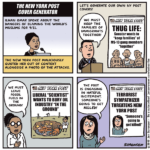 Right-wing activists latched onto the phrase “some people did something,” stripped it of its context, and dishonestly presented it as though it were Omar’s definitive statement on 9/11. The heinous New York Post cover blared “REP. ILHAN OMAR: 9/11 WAS ‘SOME PEOPLE DID SOMETHING'” — suggesting a very different sentence with a different meaning than the actual quote. As if to illustrate her very point about Islamophobia, they showed a photo of planes hitting the twin towers and accused her of lack of sympathy for the dead. Now she faces a barrage of death threats herself. Help sustain these comics — join the Sorensen Subscription Service! The last thing the Dems need as we head into 2020 is to alienate the progressive base even further. The party is already so fragmented, I worry about how we’re going to get through the next presidential election in one piece. For more, here’s the site of the campaign against the blacklist. 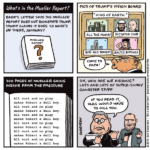 While I still believe there’s not much to say about the Mueller Report until we actually know what’s in the Mueller Report, the response to the Barr letter has been disturbing. Barr was specifically hired to defend Trump at all costs. The man is a partisan toad with a long track record of partisan toadery; it’s what he does. The Trump administration is defined by disinformation; it’s what they do. To take anything said by a Trump official at face value, ignoring this vast context of corruption and disinformation, is simply bad journalism and poor critical thinking. It is undisputed that the Russian government brazenly interfered in the 2016 election to support Donald Trump. In so doing, the Russians and those acting on their behalf committed a variety of federal crimes including computer hacking and conspiracy to defraud the U.S. Those crimes were committed to benefit (a) Vladimir Putin and the interests of the Russian government; and (b) Donald J. Trump. It is also undisputed that Trump and his campaign joyfully used and weaponized the information the Russians stole against Hillary Clinton. Trump personally trumpeted the Wikileaks disclosures 141 times during the campaign, and his surrogates countless more times. While Mueller’s team apparently “did not establish” (i.e., did not find enough evidence to charge criminally) that Trump personally conspired with the Russian government to commit the underlying crimes, there is no question that he was (along with Putin) the single biggest beneficiary of those criminal efforts. Now, pro-Trump conspiracy theorists are feeling extra-emboldened to call those who have actually followed this story the real conspiracy theorists. It’s all rather depressingly Orwellian.